Historically, sidemount diving was for extreme, technical divers who used the configuration to penetrate small sections of caves. But its adaptability and advantages have been discovered by divers of varied experience levels, and that, coupled with advances in equipment and greater availability of training, has made sidemount diving an increasingly common application. It’s not just for cave divers anymore. Sidemount is a gear configuration in which a diver wears a tank on each side of his body instead of mounted on his back. Sidemount tanks lie parallel to the body, below the shoulders and along the hips. Since the tanks are not connected by an isolation manifold, as they are in a backmount configuration, the diver has two separate and redundant sources of gas and will breathe first from one tank and then the other, switching back and forth between two independent regulators throughout the dive. The clips on the bottom of the tanks are attached below the hip, and the top of the tank is secured with a bungee system, which allows the tanks to ride along the side. 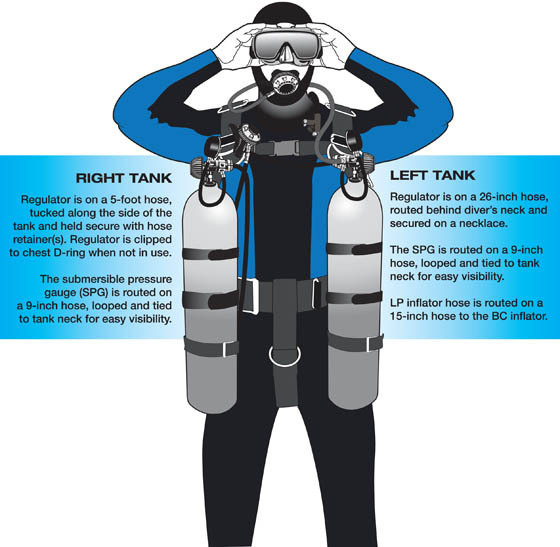 The advantages of sidemount diving first resonated with advanced and technical divers who realized that wearing tanks on the side of the body created a lower profile in the water than traditional backmounted tanks, thereby allowing access to, and the exploration of, small spaces without disturbing the environment. Less silt equaled greater access. Wreck divers discovered they could push a tank ahead of them into a small hatchway by simply unclipping the bottom portion of the tank from the buttplate. Cave divers saw the same benefits when working their way through low, overhead passageways. Reef divers, too, implemented sidemount diving to improve the navigation of tight coral canyons while hopefully reducing unintentional coral contact. Sidemount configurations are proving a good fit with the increasing popularity of rebreather diving. Because of the cluttered front presented by rebreather hardware, the sidemounted “bailout bottles” provide an unobtrusive way to carry an emergency air supply. The sidemount tanks also provide a ballast of sorts, creating a more streamlined profile and manageable center of gravity. Both recreational and technical certification agencies now offer sidemount training, making it easier to find an instructor. More and more sidemount divers are seen on boats and at dive sites; as part of your due diligence, ask their opinion on why they choose to sidemount and what safety features are critical to the dive environment. There’s a wealth of information eagerly disseminated amongst those early adapters of the equipment. For while it’s not necessarily mainstream just yet, sidemounting has definitely come out of the cave and into the light of day.